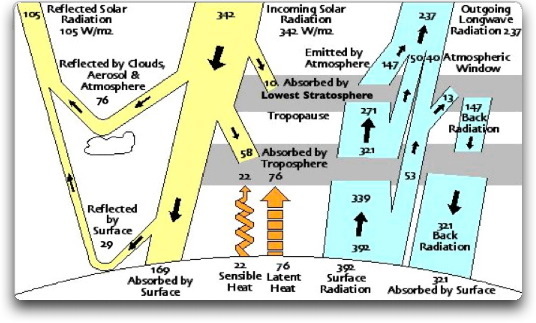 Another Look at Climate Sensitivity | Wott's Up With That? “Another Look at Climate Sensitivity“. Willis Eschenbach, citizen-scientist, thinks that the “equilibrium value of the climate sensitivity [of CO2] (as defined by the IPCC) is certain to be smaller” than that agreed upon by experts in atmosphere physics. Willis starts his pondering with a figure from an out-dated 1997 paper by Kiehl & Trenberth. Trenberth ‘famously’ said recently that “we can’t account for the lack of warming at the moment and it is a travesty that we can’t” (actually referring to the Earth’s energy inputs), but Willis thinks its good enough for noodling around and conclusively proving everyone wrong. Willis' variation on Kiehl & Trenberth's figure. Based on his imagining the Earth as a “blackbody” (aka “black body” in scientific literature), Willis calculates a natural warming effect of our atmosphere as 8°C. Wait, make that 20°C! Wait, make it 18°C! (There’s always a lot of revision based on comments in anything Willis posts.) Wikipedia tells us that the Earth’s average temperature of 14°C would be about -19°C without our atmosphere, a 35°C difference, but Willis knows better. His conclusion? Somehow much less than 0.5°C, not to 2°C to 4.5°C for a CO2 doubling used by conventional scientists. Go to the post and let me know if you can figure out his reasoning. CO2 is the only thing in the models that provides a mechanism for gradual modeled warming. Since the models are tuned to the past, if the temperature rise is overestimated, the effect of CO2 needs to be larger to mimic the temperature rise. This is true no matter the size of the UHI effect. So I guess his theory is that climatologists are intentionally (and secretly) over-estimating the climate sensitivity of CO2 to make their evil climate models look scary. Good luck with that. I expect that he feels safe and comfortable with WUWT, where he’s guaranteed to get at least a few comments like “brilliant analysis”. Although every now and again someone thinks enough of his writing to point out the worst of the flaws. Most wouldn’t bother. Willis first made a deep impression on me when he claimed that he, along with a few other WUWT alums, was “doing better science” than Mann, Hansen et al. He really believes himself to be a great scientist, despite regularly bungling basic scientific concepts like the null hypothesis, statistical significance, and external validity. I didn’t have my copy of Haughton’s textbook in front of me, but the instant I saw this post at WUWT and read Willis’s statement that the natural GH effect was only 8C, I knew something was wrong here. Go pull out the textbooks on atmospheric sciences, Willis, and first prove them all wrong. Then we can get to the rest of your case here.